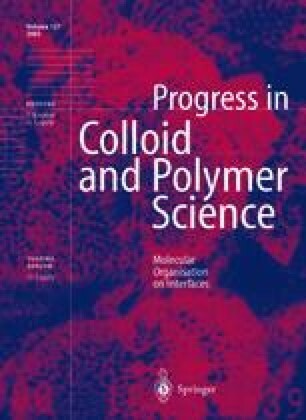 Colloidal dispersions of solid triglycerides as potential drug carriers are preferably prepared by high-pressure homogenization of molten triglycerides in an aqueous phase with adequate stabilizers and subsequent crystallization of the emulsified lipid particles. The influence of several commercial ionic and nonionic stabilizers and their blends with phosholipid on the crystallization and subsequent polymorphic transitions of tripalmitin nanoparticles was investigated. The stabilizers differed, for example, in the hydrophilic head group and the length and degree of saturation of the hydrophobic chains. Besides macroscopic effects in some of the systems, the stabilizers had pronounced effects on crystallization and polymorphic transitions. There was a clear lower limit for the critical crystallization temperature in agreement with the theory of homogenous nucleation. For some of the dispersions, the appearance of X-ray reflections and thermal events suggested that interactions with the stabilizer layer induced crystallization of the triglyceride at higher temperatures. The transformation of the nanoparticles from the metastable α polymorph to the stable β polymorph proceeded at different rates for the different types of stabilizers and was in most cases not quantitative within the time scale of the X-ray experiments. A complex X-ray diffraction pattern for some of the dispersions complicated the direct comparison of the transition processes. The presence of ionic surfactants often led to a slower transformation than stabilization with nonionic surfactants and their blends with phospholipids.